There is no need to compromise when reaching out to reach people. We can stand firm and love well without ever compromising the words of Jesus. God is about truth and grace. 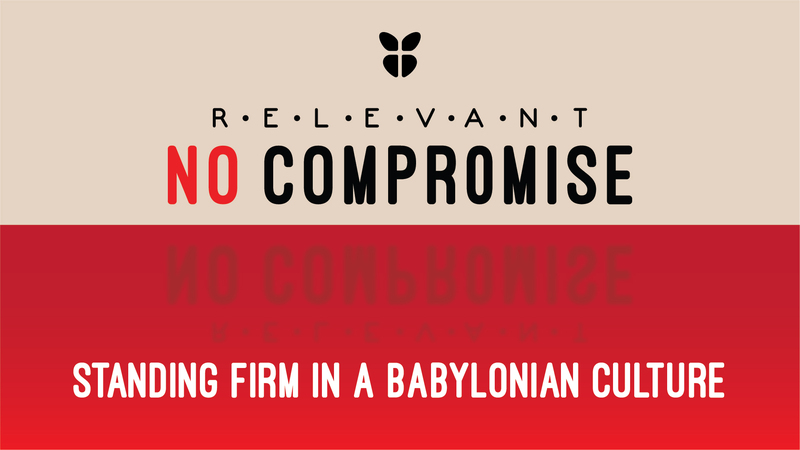 Culture will cause us to decide: deny God or die; but we must stand firm in the faith (1 Cor. 16:13-14). The worst battle we may have to face today is to be ridiculed for our faith. In Daniel 3:1-7 King Nebuchadnezzar commanded the people to bow to his statue. Culture will bring you to that place where you feel you have to do certain things or else. What you worship is very important. When the three Hebrew young men did not bow, the king had them thrown into the fire (Dan. 3:15). Many times we are put in positions of dilemma. But remember, greater is He who is in us, than he who is in the world. Standing firm takes courage. Courage comes from the Latin word – heart. Courage is not being without fear but moving forward in spite of our fears. We do not bow to our fears! The young men replied, “O Nebuchadnezzar, we do not need to defend ourselves before you (Dan. 3:16). Something rose up inside their heart – something stirred within them. When we take a step of courage something wonderful always happens. Faith begins to rise. Have faith in a God who is on your side and delivers you out of situations. God is with us. We do not need to feel that we stand alone. The three Hebrew young men had a faith and a belief that God was on their side. As Christians we are in a win-win situation. Because the young men took a stand, God showed up in the fire and delivered them. Their faith led to the king recognizing God, as God Almighty. Standing firm inspires others. Culture will not always hate us for our stance! At times they will love and respect us. The king promoted the 3 Hebrews who took a stand. We are called by God to do amazing things in Him and for Him. We are on a mission for God. You are a leader for God when you are influencing the world for God. Find your place in God to make a difference in this world. We do not want to resound what everyone else is saying. Be who God calls you to be, in Jesus’ name. “We are standing for something and not against something.” Focus on God, not what you don’t like in the culture. We need to give people something to live for and not something to live against. Let me give us things we can stand for. Prayer in the Bible is not passive. When we pray we must put on the full armour of God, and take a stand against the devil (Eph. 6:13-14). All of hell is going to try and stop you from doing what you are doing for and with God. God has called us for such a time as this. Never give up your calling in life. Make up your mind. Be strong and immovable in your stance for God because nothing you do for Him is ever useless (1 Cor. 15:58). If nothing else stand for God as He stood for us. Jesus made Himself of no reputation (Philippians 2:7) ‘For the joy set before Him, He endured the cross’ (Hebrews 12:2). The joy was us! Jesus took a bold stand for us. “If we acknowledge Jesus before people, He will acknowledge us before the Father.” Let’s stand for God, Jesus Christ and His mighty Word. When we stand, Jesus stands with us!